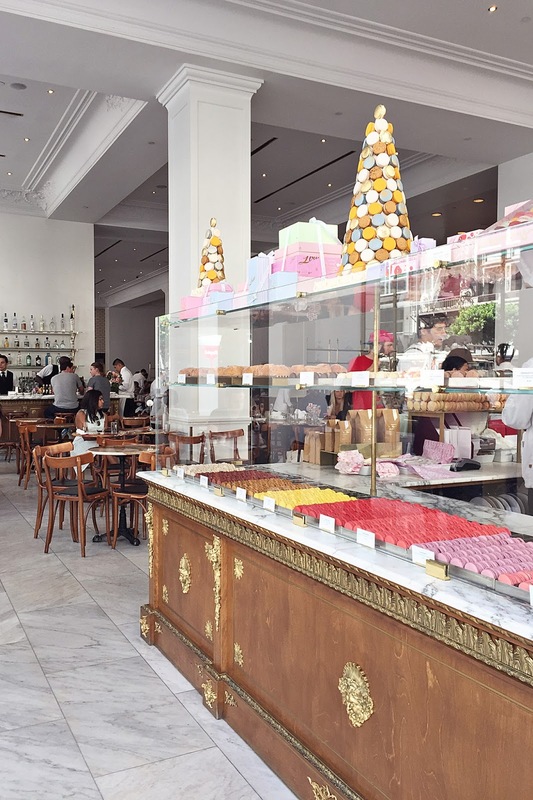 I found my favorite place in L.A. -- Bottega Louie. My cousin took me there for brunch because she knew I would love it. Give me European decor, Italian-influenced cuisine, and French pastries and I am in heaven! 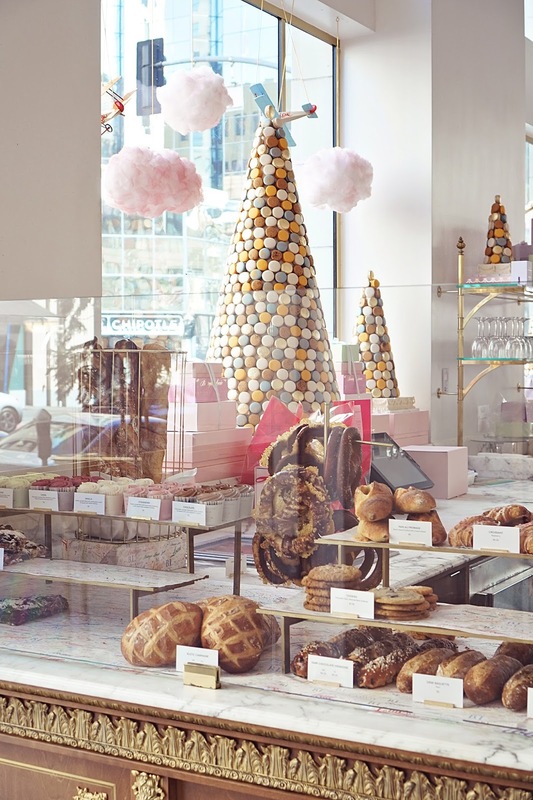 Everything about Bottega Louie was perfect from the white marble, to the pink macarons, to the gold (everything) accents. Oh, and the food was delicious. We tried a little bit of everything but the crowd favorites were the lemon ricotta pancakes and the farmer's market scramble. And we all know what was for dessert. I had to exert tremendous self control while browsing the bakery and store. 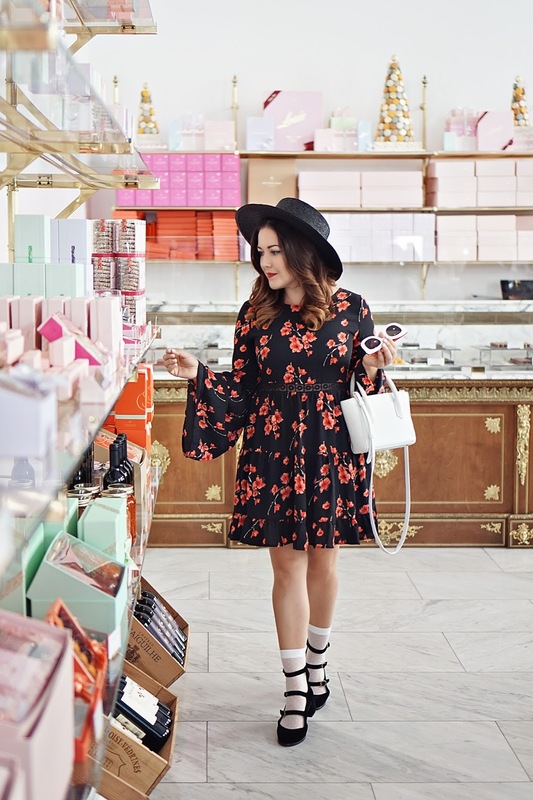 So many delicious treats and pink things to purchase, so little time. 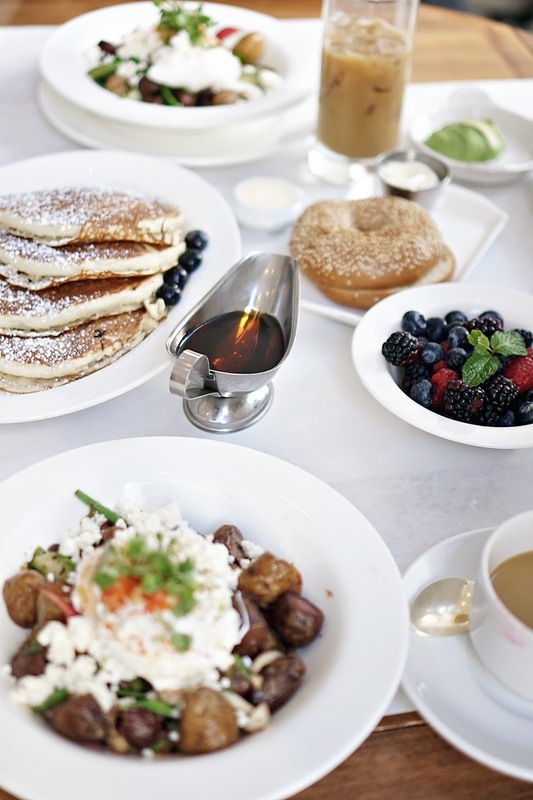 For a weekend of brunching, sipping mimosas, and exploring downtown L.A. 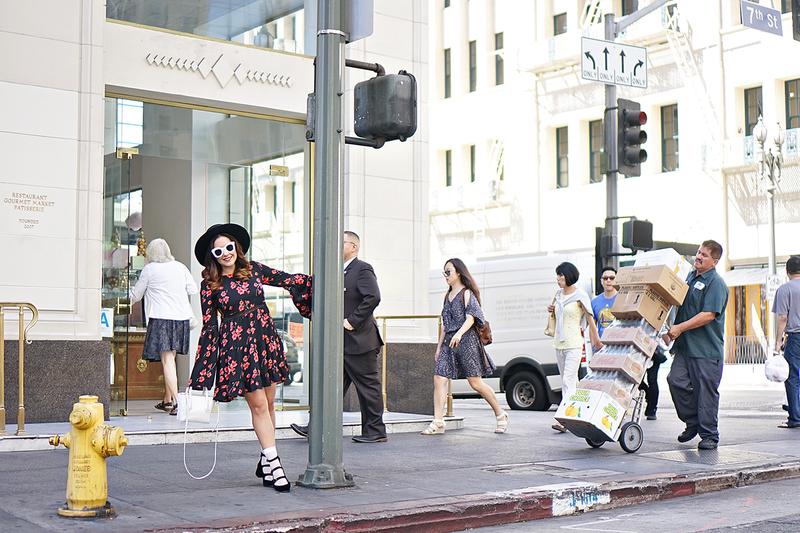 I wore my favorite new dress from LuLus, which I scored for less than $50. I love the tiered skirt, lace detail on the bodice, bell sleeves, and red floral print. It is the perfect dress to transition into fall. I paired the it with my new favorite strappy velvet mary janes. One of my favorite trends I picked up while living in Italy is the dolly sock with heels trend. I love it because I think it's cute, quirky, and actually practical. No more blisters from your heels! It is not the easiest look to pull off. It takes some confidence and a sock that hits in just the right spot to avoid shortening and widening your legs. If you want to elongate your legs, go with over-the-knee socks instead. I have had a lot of fun dressing for the past two years. I have been on fellowship and out of the classroom for awhile now. Spending time writing and researching rather than teaching means I've had the freedom to express myself more and have fun with fashion (especially while I was abroad). But this upcoming spring I will be returning to the classroom, which means I have to start refocusing my wardrobe a bit and start investing in some workwear again. I am not terribly excited about this lol.